We have successfully deterred a resumption of hostilities by the north for 64 years and I believe we have to continue to deter for as long as it takes until we resolve the security problem on the peninsula. We should keep in mind the wise words of Sir Lawrence Freedman who said "Deterrence works, until it doesn't." A Strategic Planning and Preparation Paralysis arises from a fear of what comes next - how to navigate through the War/Collapse Paradox. "There are only two ways to approach planning for the collapse of North Korea: to be ill-prepared or to be really ill-prepared." Sun Tzu wrote "never assume the enemy will not attack, make yourself invincible." - The Collapse Corollary is: Never assume the KFR will not collapse - prepare now even though we cannot predict if and when. We should realize that collapse will be catastrophic. Lastly, we suffer from the tyranny of proximity - the range of north Korean artillery threat to the Greater Seoul Metropolitan Area. This restricts our policy options and strategy. Here is the Problem: There is no US and ROK comprehensive strategy to solve the "Korea Question" and address the full spectrum of threats caused by the existence of the Kim Family Regime (KFR). We must answer these Key Questions: What do we want to achieve in Korea? What is the acceptable durable political arrangement on the Korean peninsula and in Northeast Asia that will serve and protect ROK and US interests? For any strategy you must make assumptions when you do not have all the facts but must continue planning. You continue to use the assumptions until they are proven as facts. And if the assumptions prove false or erroneous then you must adapt your plans and strategy based on the new facts. Since Korea is such a hard case I feel it is necessary to list fifteen assumptions that drive my strategic thinking. The KFR will not give up its nuclear and missile programs. China and Russia will not solve the Korean Question or force the KFR to give up its nuclear and missile programs. China and Russia will exploit KFR threats to undermine US credibility and split the ROK/US Alliance. A pre-emptive strike will not be able to completely eliminate the KFR nuclear and missile threats in a single operation. A pre-emptive strike will result in a catastrophic response from the north. Survival of the KFR remains the vital national interest to the north, thus it can be deterred from catastrophic attack. The regime will not trust any security guarantee by the US and will not waver from the belief that the US seeks the end of the KFR. Sanctions do not help the problem without enforcement by China and the international community. KFR's global illicit activities provide hard currency to support the regime and nuclear and missile programs. The north will only submit to unification if the KFR remains in power. The north is prepared to achieve unification by coercion of the ROK or force and believes this is vital to regime survival. The most important deterrent to resuming hostilities by north Korea is to sustain the illusion that the Kim Family Regime will continue to survive. The policies of the Trump and Moon administrations are mostly in accord regarding NK and should remain constant - both agree to (1) pursue denuclearization of North Korea in a peaceful manner-and without seeking 'regime change'; (2) to the use of sanctions/pressure as diplomatic tools; (3) and to supporting South Korea's lead role in re-opening inter-Korean dialogue. Emboldened by the above, President Moon Jae-in will doggedly pursue the policy tenets and principles that support his new Berlin Doctrine. Last and most importantly is this assumption that guides my strategic thinking: The only way we are going to see an end to the nuclear program and threats and to the crimes against humanity being committed against the Korean people living in the north by the mafia-like crime family cult known as the Kim family regime is through achievement of unification and the establishment of a United Republic of Korea that is secure and stable, non-nuclear, economically vibrant, and unified under a liberal constitutional form of government determined by the Korean people. Here is the Situation: The KFR poses an existential threat to the ROK and is a threat to the international community and the US. When hostilities resume on the peninsula or there is a catastrophic collapse of the regime it will have global impact. The ROK/US Alliance requires a strategy that goes beyond the nuclear and missile program to achieve an acceptable, durable political arrangement that protects ROK and US interests and results in a secure and stable Korean peninsula. Kim Jong-un has maintained the initiative. He has conducted and continues to provocations and strategic demonstrations (nuclear and missile tests) not only to gain political and economic concessions but also to cause the US and international community to react in the near term. The US, ROK, and international community response to every provocation and strategic demonstration prevents the ROK and US from designing and executing a long term strategy. Kim Jong-un may know us better than we know him. How do we take a long term approach that results in solving the Korea question? This is a proposed Strategic Vision: The ROK/Alliance maintains a deterrence and defense posture and copes with, contains, and manages the near term provocations and crises and executes a long term sustained strategy that focuses on allowing the internal political dynamics in north Korea to play out which may lead to internal resistance leading to internal regime removal and dismantlement with an emerging leadership who seeks peaceful unification: a Unified Republic of Korea (UROK). We must allow the internal political dynamics to drive change within the north and provide indirect and psychological support where we can. This can be executed using President Moon's new Berlin Doctrine for relations and reunification with north Korea (found here) The bottom line is that we can truthfully and publically say we do not seek regime change. Privately we will support the regime removal through internal resistance by the Korean people living in the north. Selected Ways and Means: This consists of four parts and numerous actions and tasks. 1. 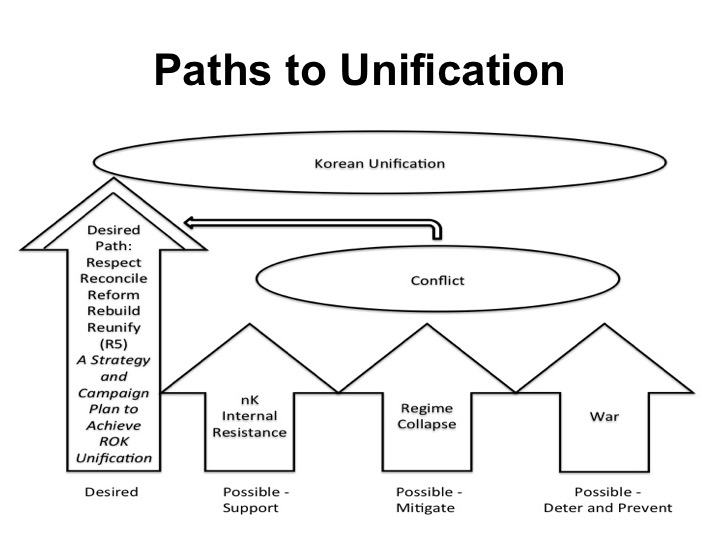 The Number one priority is Development and execution of information/psychological preparation of the environment - a sophisticated and aggressive information and influence activities campaign focused three target audiences: number 1- Deterrence of the Kim Family Regime; number 2- on the population to prepare them for the future (i.e., unification), and number 3- on the "2d tier leadership" by using a combination of coercion and co-option and an "exit strategy" for 2d tier military leaders and party members outside the core elite. 2. Development of an overt policy and strategy that states peaceful unification and not regime change is the desired end. The Korean Question (para 60 of the 1953 Korean Armistice Agreement) must be solved by Koreans and the US will support the Korean people in solving their problems. Until the Korea Question is solved the US will support the ROK/US Alliance with focus on the "Big 5." 1. War - must deter, and if attacked defend, fight and win. 2. Regime Collapse - must prepare for the real possibility and understand it could lead to war and both war and regime collapse could result in resistance to unification within the north. 3. Human Rights and Crimes Against Humanity - (gulags, external forced labor, etc) must focus on as it is a threat to the Kim Family Regime and undermines domestic legitimacy - and it is a moral imperative. 4. Asymmetric threats (provocations, nuclear program, missile, cyber, and SOF) and global illicit activities. 5. Unification - the biggest challenge and the solution. The challenge for the Republic of Korea (ROK), the US, the regional powers, and the international community is how to get from our current state of Armistice and temporary cessation of hostilities to unification as the path most likely will involve some level of conflict ranging from war to civil conflict and potentially horrendous human suffering in the northern part of Korea. The ROK and its friends and allies face an extraordinary security challenge because of the "Big Five." War, regime collapse, and the nuclear and missile programs pose an existential threat. It is a moral imperative to work to relieve the suffering of the Korean people who live in the worst sustained human rights conditions in modern history. While unification is the desired and necessary "end state," or better yet the acceptable durable political arrangement, achieving it will be costly in treasure for sure and blood as well as there is likely no path to unification without some form of conflict, it may only be a question of scale. There are four paths to unification. The ideal is peaceful unification that comes as a result of respect, reconciliation, reform, rebuilding, and reunification (R5). Although this is unlikely to occur because of the nature of the Kim Family Regime and its zero sum view of unification (whichever government unifies the peninsula means the other government will be eliminated). Perhaps counterintuitive, this is the most difficult path to plan for because it requires complete integration of the political and economic systems, the security forces, and a complete overhaul of the infrastructure in the northern part of Korea. However, planning for this most difficult case will apply to any of the other paths to unification. People often are confounded by planning for unification because they want to know in what way it will be achieved: through peace, war, or regime collapse. Peaceful unification planning requires the broadest range of planning that encompasses every aspect of the Korean nation on the north and south side of the DMZ. The second path is through war. Of course we do not want to experience a war but that will be decided by Kim Jong-un and his decision making process. Again it is counterintuitive that after a war might be the easiest path to unification because the north Korean military will be defeated, the economy completely destroyed, and the political system will no longer exist, the vast majority of the infrastructure will be irreparable and require rebuilding from the ground up. The third path is arguably the most complex because regime collapse will certainly lead to some form of conflict that could include war. Collapse is unlikely to be a benign event resulting in absorption though if it does planning for peaceful unification will have proven to be wise. There is a fourth path that may be considered an outlier. That is one in which some form of internal resistance is able to gain power, eliminate the Kim Family Regime and if psychologically prepared and properly supported by the ROK, it might seek peaceful unification in order to ensure survival of the Korean people living in the north. These paths and the contingencies that we can expect are complex and require detailed planning and preparation. Although they are related each must be planned for in detail and each requires different forces, resources, and concepts of operation. There is one action that is common to all scenarios: a comprehensive information campaign that will provide the intellectual and emotional foundation for unification. While planning is important, the ROK and its friends, partners, and allies can and must begin preparing now for unification through an integrated, long term, focused, and fully resourced information campaign plan. Fundamentally, the ROK and US Presidents need to decide to execute a holistic information campaign to support unification. 3. Development of a classified policy and strategy . It is critical to have a classified policy and strategy that integrates critical ways and means that must protected from compromise and exposure to the KFR. 4. Coping, Containment, and Management. Recognizing the above assumptions we have to develop options for the ROK and US to execute creative policies to address the 8 major contingencies and the current threats, the regime's support for the nuclear and missile program, and the regime's illicit activities around the world. I will outline 3 guiding principles and the 7 steps of preparation for addressing the contingencies and support to a holistic strategy. With an understanding that unification is the long term acceptable durable political arrangement and that the north's threats must be deterred and contained until unification can be achieved there are myriad actions that can be undertaken from direct engagement between north and South, return to the Six Party talks or some other format, and discussions of working toward a peace treaty and normalization. These have all been proposed over the years. Although these types of actions come with political risk of being accused of rewarding north Korean bad behavior or de facto recognizing the north as a nuclear power political leaders who advocate for these types of actions must remember that all actions would be for the purpose of coping, containing, and managing the north Korean situation until the strategy can be implemented and it achieves success. The overt policy of seeking peaceful unification of the Korea question and Korean solutions reached by the Korean people provide the overarching rationale for all actions while at the same time maintaining the proper level of deterrence and defensive capability to protect the ROK. Execute a strategic strangulation campaign that focuses on shutting down the KFR's illicit activities network. While sanctions and specifically secondary sanctions should be pursued, a quiet diplomatic, intelligence, and law enforcement campaign should be executed to influence countries around the world to shut down the KFR's illicit activities and use of slave labor to gain hard currency. The intent is to ask countries simply to enforce their domestic laws as well as international law because north Korean diplomats are exploiting their diplomatic status for trafficking counterfeit dollars, drugs, cigarettes, and other contraband. US intelligence and law enforcement agencies (primarily FBI and DEA) will liaise with countries to provide intelligence on north Korean activities and advise on law enforcement activities. Conduct aggressive cyber campaign to penetrate north Korean networks to target north Korean nuclear and missile programs as well as to support a sophisticated and aggressive information and influence activities campaign. Reinvigorate the Proliferation Security Initiative (PSI) and seek renewed support from the 104 nations that previously pledged support. Alternatives to Conventional Diplomacy. Our options are limited. Conventional or traditional diplomacy has failed and does not currently present a viable option for a way forward. A preventative war or even pre-emptive strike will likely result in death and destruction and expenditure of blood and treasure on a scale not seen in the world since 1953 and it will likely be on an even greater scale in the 21st century. Externally imposed regime such as was done in Iraq is not a viable option as it is really in the same category as preventative war. The only option is for us to cope, contain, and manage the situation until new leadership emerges in the north that will seek a diplomatic solution to the Korea question. So how do we cope, contain, and manage the situation? One course of action my lie in what has worked in the past: military to military talks at the General Officer level. What is the only agreement that the north has nominally lived up to? The 1953 Armistice. Who negotiated it? General and Flag Officers. I recommend that we propose such talks to be held with the Commander and Deputy Commander of the ROK/US Combined Forces Command and the ROK and US Chairmen of the Joint Chiefs of Staff representing the Alliance and the Minister of the People's Armed Forces and the commanders of the frontline corps, (IV, II, V, and I corps) representing the north. These talks would have no diplomatic preconditions. Two questions arise: Why would the north agree to this and what would be the purpose of such talks? First, the north may agree because such a proposal would be recognition of the strength and power of the north Korean military. Kim would assess this would mean that he is being further legitimatized and with no diplomatic preconditions he might assess that he can now return to his playbook which uses provocations, threats of provocation, and strategic demonstrations (nuclear and missile tests) to gain political and economic concessions. He will likely believe that this is reinforcing his "win" at the UN General Assembly. Second, the objective of these talks would be solely to conduct a deterrent dialogue and to prevent escalation and miscalculation among professional military officers. There would be no discussion of denuclearization but there would be a clear articulation of the costs of an attack on the South. Once the deterrence dialogue is established there could be discussion of other issues such as operations in the West Sea in the vicinity of the Northern Limit Line, the Northwest Islands, and other areas of military concern and potential military confidence building measures. To reiterate, the purpose of these talks would be to cope, contain, and manage the Korea problem until such time as diplomats can assume the lead or there is a change in leadership in the north. The ROK and US can develop and execute a long term strategy focused on unification and preparations to support an emerging new leader in Pyongyang. Another very important benefit of this approach would be establishing relationships among general officers. This will be crucial in any instability scenario. If ROK generals can reach out directly to the north Korean front line corps commanders during instability the chance of conflict through misunderstanding and miscalculation can be reduced. Most important the ROK/US Alliance would operate from the strength of its deterrent capability. Deterrence has worked for 64 years and will continue to work if the ROK/US Alliance is sustained. We can of again attempt a return to a sunshine policy and engagement or six party talks or any other creative new initiatives that the ROK and US political leaders would like to try. But before such attempts are made it is critically important that all actions rest on the foundation of deterrence. Critical to deterrence is ensuring that military decision makers clearly understand the capabilities and intent of their opponents. The best way to do that is to conduct a deterrence dialogue with senior military leaders. Provocations and strategic demonstrations to gain political and economic concessions. nK Attack - execution of the nK campaign plan to reunify the peninsula by force. WMD, loss of control - seize and secure operations. Resistance to foreign intervention (e.g., insurgency). Key: How to handle the nKPA during regime collapse short of war. Defense of ROK is paramount - all decisions must support defense of ROK against the full range of threats from the north. Must provide options to national policy makers - early decisions are required to overcome the law of physics: time, distance, and space. We must have the right capabilities in the right place for employment at the right time. Defense and Security of ROK is the number one priority. Security, health, and welfare of the Korean people living in the north and South. UNC and ROK/US CFC desire to work with all interested nations to bring security, stability and long term peace to the Korean peninsula and Northeast Asia. UNC and ROK/US CFC will support the establishment of a unified peninsula - a United Republic of Korea. The 7 Steps of Preparation for elements of national power of the ROK and US. The governments of the ROK and US must agree to establish a permanent ROK and US north Korea Strategy Division (KSD) in the Blue House and White House and use the two divisions to form a Combined Korea Strategy Group (CKSG) in order to synchronize, orchestrate, and manage policy and strategy development and execution. Each government would appoint an Ambassador for north Korean Strategy who would have coordinating authority over their respective interagency national security decision making apparatus to ensure synchronized actions by each government in order to support achieving the long term, acceptable, durable political arrangement that will meet ROK and US strategic objectives: a United Republic of Korea that is a stable, secure, peaceful, economically vibrant, non-nuclear peninsula, reunified under a liberal constitutional form of government determined by the Korean people. On the US side the Korean Strategy Division would orchestrate and synchronize the activities of all the "Korea desks" of the NSC, DOS, DOD, DOJ, Treasury, and other agencies to include the intelligence community as well as the Congressionally mandated Ambassador for north Korean Human Rights and the Special Envoy for Six Party Talks. The strategy division would oversee the sophisticated and aggressive information and influence activities campaign and informally coordinate Track 1.5 and Track 2 activities of Americans who engage with north Korea. What I have provided is broad sketch of the basics of a strategy. It is by no means complete. A Combined Korea Strategy Group (ROK and US) should be established to flesh out a strategy. The only way we are going to see an end to the nuclear program and threats and to the crimes against humanity being committed against the Korean people living in the north by the mafia-like crime family cult known as the Kim family regime is through achievement of unification and the establishment of a United Republic of Korea that is secure and stable, non-nuclear, economically vibrant, and unified under a liberal constitutional form of government determined by the Korean people. David S. Maxwell is the Associate Director of the Center for Security Studies and an ICAS fellow. He is retired US Army Special Forces Colonel with five tours in the Republic of Korea.